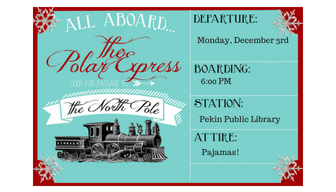 All Aboard the Polar Pajama Express @ the Miller Senior Citizens Center! Hear a very special telling of "The Polar Express" and enjoy hot chocolate and more in our winter wonderland! PJ's encouraged! Please register all attending (adults too!). All ages welcome.